My vehicle was impounded, How do I get it back? -No Driver License -Driving with a Suspended Driver License -Driving with a Revoked Driver License -Driving with a License that is Expired by More than 90 Days. If you were driving a vehicle or own a vehicle that was impounded by the Oneonta Police Department, You will need the following items before your vehicle will be released from impound. If the registered owner is not a licensed driver, the owner must produce a valid photo identification. In addition, the owner will need to bring (2) licensed drivers with him/her to the Oneonta Police Department before the vehicle can be released. If the registered owner of the vehicle is unable to claim their vehicle in person, the owner will need to send a notarized letter giving the department permission to release the vehicle. If you have any questions you may contact the Oneonta Police Department at (205) 625-4351. 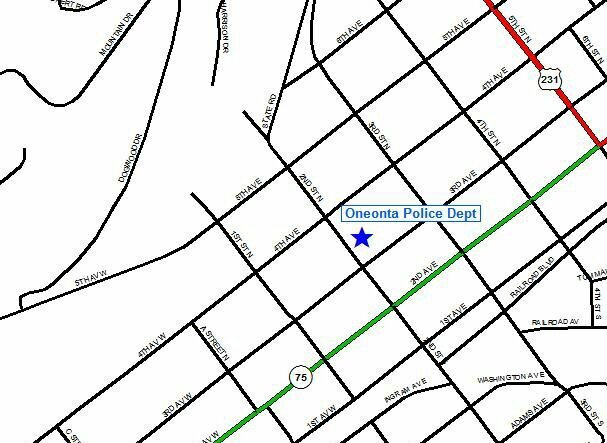 The Oneonta Police Department utilizes 20 sworn full time police officers, 4 sworn part time police officers, and 1 civilian secretary in an effort to serve the city of Oneonta.